Based on the layout of your premises and the intensity of termite infestation, we will create a customized treatment plan to effectively control termites in your premises. Direct Liquid treatment help to deter termites immediately and also protects from future infestations. Liquid treatments may be applied on the inside,outside and within the foundation,providing a protective area around the premises. When our termite technician arrives, he/she will first review the report and graph of the property and verify all treatment specifications. 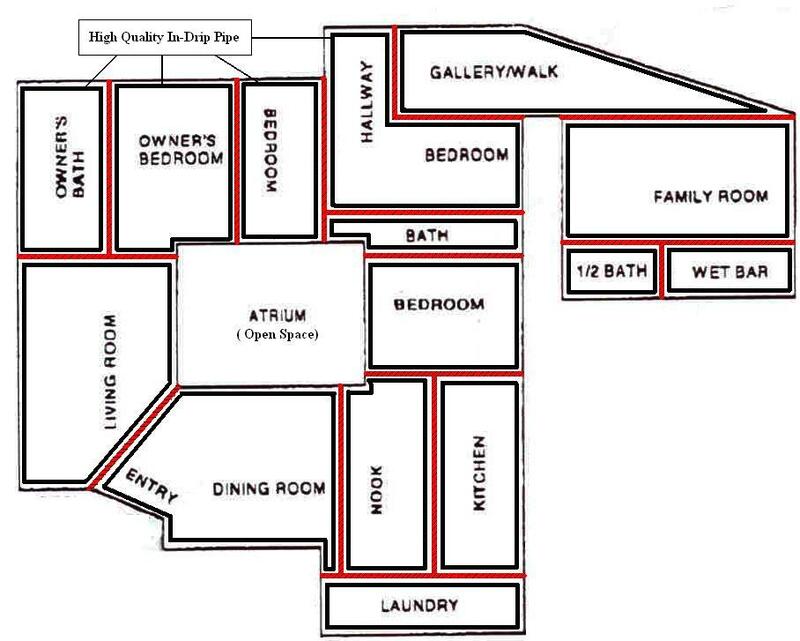 After taking a careful inventory of critical areas such as sunken areas, bathrooms, plumbing access into the structure, existing termite activity and other areas we know require special attention, our technician will begin the treatment process. Each structure is unique and each treatment is customized to the individual building, but treatments can include a combination of the following areas and methodologies. Trench around the exterior foundation. This protects the outside foundation of your home from ongoing termite activity. The majority of subterranean termite activity in homes starts on the exterior foundation. A thorough treatment of this vital area on a structure can ensure that termites do not continue their feeding. Foaming of interior wall voids. This may include areas, which are seeing ongoing activity, plumbing accesses, around air returns and other vital areas. This prevents the termites from being able to enter the structure, or stops them from continuing their activity inside your home. When properly done, foaming is among the least invasive and most effective tools in a professionals arsenal. Drilling abutting patios or sidewalks. There are circumstances when abutting patios or sidewalks need to be drilled. This allows our technician to place termiticides in areas where concrete prevents other treatment strategies. Trenching around interior crawl space foundation and piers/posts. 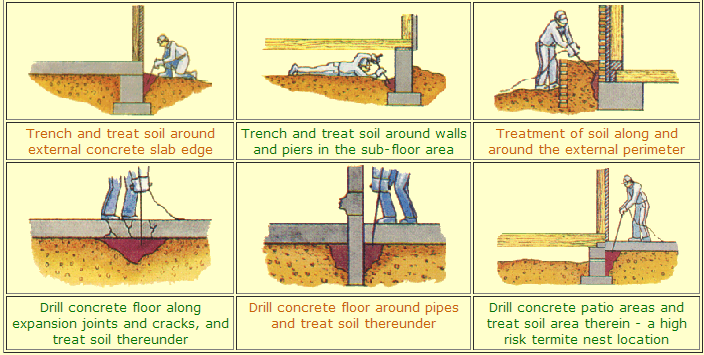 In homes with crawl spaces, a trench is dug around the foundation and pier and/or posts. Drilling injecting Chemicals into it, spraying on wooden structures, Coating on selected areas. We use specialized equipment such as drills, pressure injectors, pressure-generating pumps and high-gallon tanks to inject the chemical in the pipeline. High quality pipe having in-drip attachments, attached with in a distance of 1 to 1.25 feet is laid along the base of the wall through out the house in the sand before flooring. So that the equivalent pressure is maintained through out the pipe and sand enforce the capillary actions through out the flooring. THIS IS THE LIFE TIME TREATMENT METHOD, and the solution has to be enforced in the pipe with high pressure periodically. i.e. every five year without destructing the flooring of the house. The above method can also be applicated in garden or in open space with special request. Termite treatments can be classified as either 1) existing structure treatment or 2) preconstruction treatment. Preconstruction treatment refers to treatment performed prior to or during construction. For a termite soil treatment ("treatment") to be classified as a preconstruction treatment, the treatment must be performed in accordance with the termiticide (pesticide used for termite treating) label instructions and it must be performed during construction (prior to pouring of concrete footings and slabs). Basically, a preconstruction treatment is the same as an existing structure treatment with the following exception: treatment is performed to certain surface areas' prior to the pouring of concrete footings and slabs (floors, stoops, patios, walkways, driveways, or etc.) over the surface area. You can forget treating the soil under a footing after the footing is poured. If you have to drill-treat floors, stoops, patios, walkways, driveways, or other obstructions, you are performing an existing. Termite "Soil Treatment Service" consists of placing a liquid pesticide, a termiticide, into the soil in accordance with the products label/labeling instructions except as hindered, limited, or prevented by obstructions and/or customer authorization. The treated soil is sometimes referred to as a soil barrier; however, it would be more properly referred to as simply "treated soil." The service technician could place the termiticide directly into the soil by sticking the tip of the rod into the soil and pulling the valve handle lever. The technician can trench and rod the soil or s/he can direct the termiticide through a void or drill-hole towards the soil area to be treated. Rodding, therefore, refers to sticking the rod directly into the soil, through a drill-hole, through a void, or placing the rod tip against a drill-hole (using the drill-hole to direct the pesticide towards the soil area to be treated) and triggering the valve handle lever to apply the termiticide. Soil treatment is, therefore, placement of a liquid residual pesticide (a termiticide) into the soil in accordance with the product's label/labeling instructions except as hindered, limited, or prevented by obstructions and/or customer authorization. It is not a wood treatment nor is it a baiting service. Now that you know something about what a termite soil treatment consist of, you should know a few important facts about termite soil barriers (treated soil). If you have had or are planning to have a soil treatment. Wood borers are tiny beetles whose larva feed extensively in the wood. The adults make tiny pin head size holes on the surface of woods before flying out. The frass or powder starts falling out from these tiny holes. This is the first sign of infestation on the wooden surface. These are internal feeders. The surface is sprayed with petroleum base chemicals. Wood preservative chemical is injected into these tiny short holes with the help of syringe to kill larvae present in the woods.